The marketing manager for the Tourism Authority of Thailand’s newly opened Canadian office says exploring Thailand will never amount to same-old, same-old. Among other parts of the country Shubert said are deserving of tourist interest is the north’s Chiang Rai, once known for opium production but which now has locals growing tea and rice. A museum tells of the history of opium. Northeastern Thailand’s Udon Thani, in turn, has an excavation site in which artifacts dating back to the Bronze Age have been found. Other Thailand attributes cited by Shubert included the tropical country’s long coast, over 200 golf courses, opportunities to learn to cook Thai dishes and practice yoga and meditation. Meanwhile, Chris Mustachi told the gathering that 137 Pillars Suites & Residences Bangkok provides upscale accommodations in a lively part of Bangkok. 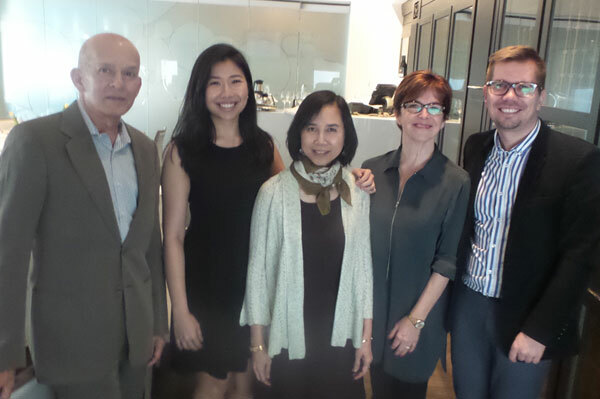 Seen here are Mustachi; and Misty Khaola-Iead, Puangpen Klanwari, Shubert and Viktor Spysak of the Tourism Authority of Thailand’s new Toronto office.